Whatever. I know the truth. And even if the meeting of toasted banana bread and melted cheddar is a figment of my imagination, I’m glad to have it in my cheese-addled mind. Yesterday, there were two overripe bananas staring at me from their place in the fruit bowl, and I was hungry, so I decided to make banana bread. I opened to the page in my breakfast recipes binder that lists both my mom’s recipe and my healthy variation on it (think applesauce replacing oil, whole wheat flour, added oat bran, etc.). I knew I wanted to make both of them at some point in the near future to test the recipes and take some photos, but I was ambivalent as to which one I wanted to do right then. One of the directions I wrote in both recipes mentions the cheddar cheese thing (the direct quote is “best toasted with melted butter and cheese. mmmmm.”), and I started thinking about my eccentric preference, and how if it was wrong, I didn’t want to be anywhere near right. And then inspiration struck. If I put the cheese in the banana bread, everyone who ate the bread would have to try it with the cheese! And I could save myself work when it came to eating it myself. All I’d have to do is toast the bread and slather a bit of Irish butter on it. Of course, I could even put butter in the bread! Here is the recipe for my fiendish master plan. Though, I would like to note that I don’t think the cheese thing is really all that weird. We pair many fruits and cheese together, and the sharpness of the cheddar really does set off the sweetness of the banana bread. The very best part of every slice, though, is the crunchy top crust formed by the sugar and cinnamon I sprinkle on right before sending the loaf into the oven. I still have the childish temptation to eat only the top half of every slice. And as less-healthy as I’m saying this is, I did use whole wheat flour rather than white. I let myself eat a lot more dairy fat than white flour, so this really isn’t so far out of my usual eating philosophy. A richer variation of my mother’s non-cheddarific recipe. In a medium mixing bowl, combine the wet ingredients. Add the dry ingredients and stir to combine again. Add the cheddar cheese and stir one more time. Scrape the batter into a loaf pan. Smother with a good dusting of sugar and cinnamon, and put the pan in the oven. Bake for 1 hour and 10 minutes, or until a toothpick inserted in the center of the loaf comes out clean. Allow to cool in the pan for 15 minutes, then remove from the pan and allow to cool until sturdy enough to cut or cool enough to wrap up and store. Next time I make this, I plan to try adding a cup and a half of cheese in search of the perfect cheese-to-banana balance. I only had two bananas this time, so I added a third of a cup of applesauce so that the batter was loose enough to stir. 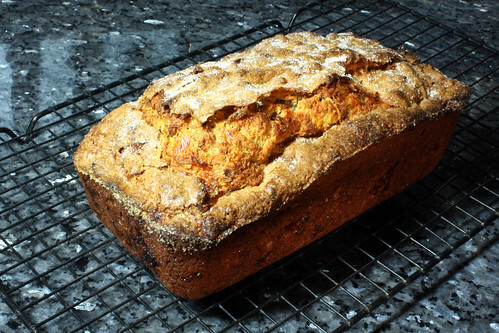 I would have never thought to put cheddar cheese in my banana bread (as much as I love cheese), but now I’m intrigued! Give it a try…and if you like it, come back and testify that I’m not nuts! 😉 My husband will admit that it does taste good (though he still prefers jam to cheese), but always in the same breath as calling me weird. It’s kind of funny, because growing up I remember that all the banana cupcakes or banana bread we bought from the store had grated cheddar cheese on them. And Thai people aren’t really big on cheese, especially back then. The flavor combination is the best. What I often is toast a cold slice of banana bread in the toaster or toaster oven, and when it’s still hot and crispy on the outside, put a slice of cheddar on top. 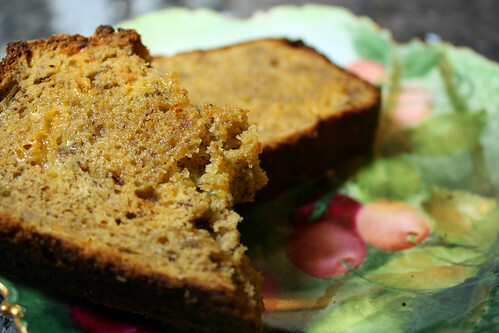 You get the gooey cheese, the crunchy and toasty exterior of the banana bread, and the warm, sweet interior. Even if we get banished, at least we’ll eat our banana bread the right way. That looks good! 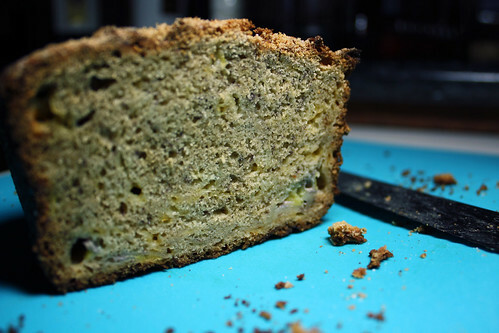 I like the sound of both serving banana bread with cheese and cheese in a banana bread! I do this, too! Not only with banana bread but also with cinnamon/raisin bread. My family used to think I was weird for liking this combo but I didn’t care. Glad I’m not alone! Wow, I specifically searched for a banana, cheddar cheese bread recipe. I found this right away, plan to make it tomorrow. I have bananas and sharp cheese that I need to use up, thought it would be a good combo since we all like fruit and cheese. Thanks!! !